spotlight shadow effect — Welcome to the GameSalad forum! Hello, I am making a game involving sweeping spotlight. I have several actors move around and I want my actors block the light and create a shadow behind them. The shape of the shadow should depends on the angle between the light and the actor. I don't know how to realize this. I attached an image to demonstrate this. Thank you. Go Download "Sub Run" in App Store. 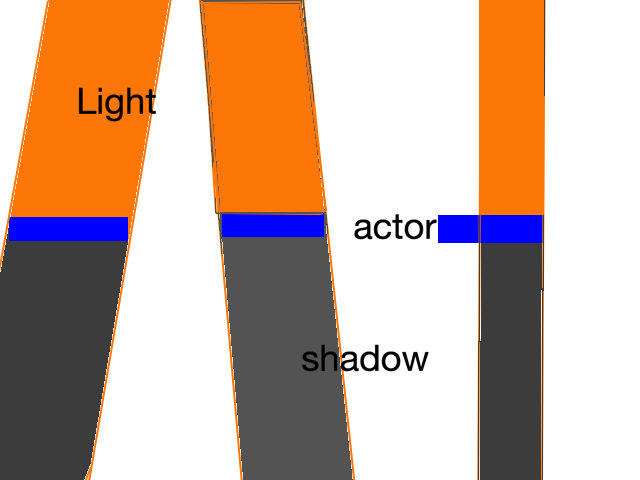 I know I can spawn a "shadow" actor and constrain its position related to the blue actors, but how can I make the shape of the shadow change when my light is shooting from a different angle. You could replicate in the opposite direction (= from main actor to light source) using the Replicate behaviour . . . . hold on, I'll make a quick demo of what I mean . . . .
EDIT: demo attached/ drag the light source around (smaller pale yellow square). It works great but in my case, I have a fixed light source and my actor is spawned randomly and move around, then this method can not work. What should I do if I want to move the actor and shadow instead of light. Thanks. It works great but in my case, I have a fixed light source and my actor is spawned randomly and move around, then this method can not work. It was just a demo file to show the concept of using Replicate to make the shadow, you are not stuck with a moving light source and a static actor, you can set it up any way you like. If you want the actor to move with the shadow then constrain the actor's x and y position to the shadow's x and y position. I was just a demo file to show the concept of using Replicate to make the shadow, you are not stuck with a moving light source and a static actor, you can set it up any way you like. If you want the actor to move with the shadow then constrain the actor's x and y position to the shadows x and y position. I've been working on it for some time and it works pretty well. Thank you!